LATE-running bus drivers – you’re booked! Irate passengers, angry at buses that fail to stop or arrive in pairs after long waits, are getting their own back in West Hampstead. 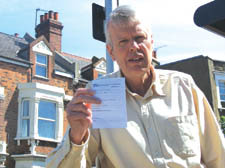 A new neighbourhood project set up by West Hampstead Amenities and Transport (WHAT) committee has seen passengers using bus report cards to note down poor service. Members are particularly concerned about the service on routes C11 and 328. One passenger has already recorded five 328 buses passing through Mill Lane in just over two minutes. Completed cards will be sent to TfL as a way of bringing home to those responsible for monitoring bus services that passengers are reaching the end of their tether. TfL has invested £116million in global positioning system tracking to help co-ordinators keep tabs on London’s fleet of 8,000 buses. A TfL spokeswoman said it was not always possible to mitigate the impact of roadworks and diversions on bus services. “Route 328 is currently on diversion around Kilburn High Road and West End Lane,” she said. “This is having an impact on the route and can lead to some bunching of buses.